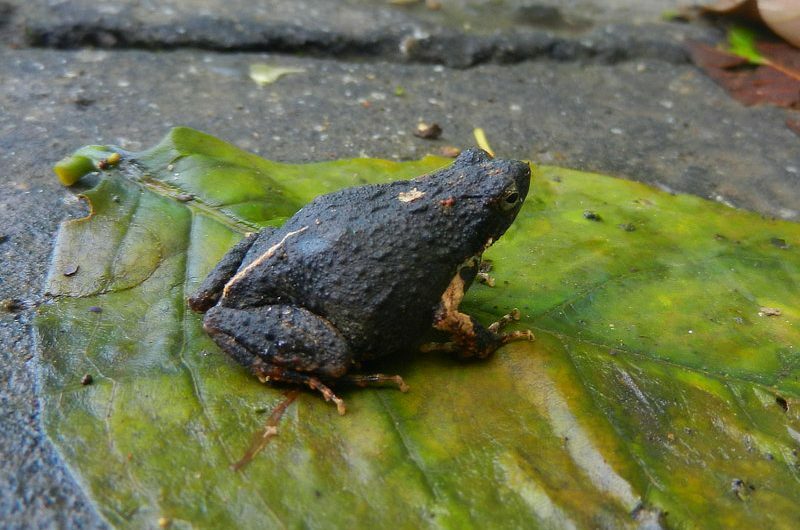 A common and well-studied frog in Panama, the Tungara Frog is best known by its unusual call “tun” followed often by “gara”, heard frequently from small forest puddles, pools, ditches and standing water bodies during the rainy season. They are medium-sized frogs; males and females are 3.3 cm and 3.6 cm in length, respectively. They are toad-like in appearance; the body, head, limbs, and even the eardrums are covered in warts. They also have a large poison gland on each side of the neck like the toads (Bufonidae). The vocal sac of the male is very large compared to the size of the body. The Tungara Frog is a member of the Leptodactylidae family, the “foam frogs”. They produce a foam nest to lay their eggs along the edges of temporary and permanent puddles on the forest floor, where the tadpoles will then develop in the rain pools. Tungara Frogs have a patchy distribution from Mexico through Central America and into northern South America, and are very common in Panama. Give-away: Tungara frogs have an unusual predator—the Fringe-lipped Bat (Trachops cirrhosus), which are attracted to the frogs by their loud call! Read an interesting article about this here.